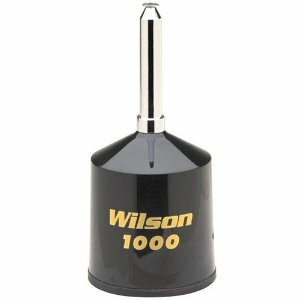 Wilson Cb Antenna replacement parts and accessories. Find a full selection of Wilson antenna accessories at GI Joe's Radio Electronics. Find on this page, steel whips (stingers), magnet, trunk and roof mount parts, wilson antenna shafts and more. More wilson antenna accessories are being added. *Replacement Base Load Coil For Wilson 1000 Magnet Mount, Trunk Mount and Roof Mount Cb Antennas. *Magnet, Coax Cable and Steel Whip "Not Included"
*Stainless steel bottom shaft for Trucker Wilson Cb Antennas. *Available in 5, 10, (18 shaft On Backorder), 22 lengths. *Click "View Detail" for length and price. *Chrome hex nut for Wilson Cb antenna bottom shaft. *Click "View Detail" for whip options and prices. *Replacement coil for Wilson 2000 trucker antennas. *Available in Black, White, Red and Blue. *Top mast and set screws included. *Click "View Detail" to select color. *Replacement load/coil for Wilson 5000 trucker antennas. *Complete replacement Roof Top Mount Assembly for Wilson 5000 roof mount antenna.